BOLLING AFB, Washington, D.C. (June 07, 2007) -- David Higgins, and wife Paulette Higgins, visited the Air Force Memorial May 31. While viewing the Memorial, the two reflected on their unique experiences with the military and with American Airmen. David, originally from Scotland, served in the British Royal Air Force for about 14 years, beginning in 1951. He began his career at the RAF's technical college, then transferred to his first assignment. It was there he served in a radar unit alongside American Airmen. Marie Renouf is joined by brother-in-law and sister, David Higgins and Paulette Higgins, May 31, at the Air Force Memorial. David served 14 years in the Royal Air Force, beginning in 1951. Paulette and Marie lived in Normandy during World War II, hiding in a hand-carved bunker with their family, while Allied soldiers invaded the beachfront near their home. "I was stationed in Germany, from 1952 to 1955, in a small town called Winterburg," David said. "On the same site, we had four Americans in a small signal unit. We were a radar unit, and the American site was for wireless signal." While the two independent units did work for a common cause, David said it was in the off duty time where they were able to meet up, swap stories and learn about each other. "We'd intermingle ... food and stuff," he said. "And their rations were different than our rations, so we'd switch and get something different." After Germany, David went to Singapore. While there, he participated in operations to support the defense of British possessions in Borneo from being taken by then Indonesian President Sukarno. After service in the Royal Air Force, David emigrated to Canada and became a citizen there. It was in Canada that he met his wife Paulette, in Montreal. Later, work with a Canadian company brought him to the United States. The two have lived in the Washington, D.C., area for about 18 years now. While David was originally from Scotland, Paulette came from France. During World War II, she and her family lived in Normandy, about 12 miles from some of the shoreline where Allies invaded to reclaim German occupied France on June 6, 1944. Paulette said she and her family had hidden themselves during that invasion. "My father built a hole with my brothers -- because they knew something was happening," she said. "We went under on the fourth of June. Early in the morning we went down in the hole and we stayed there until the first American came through." She said the first American they saw was an African-American soldier. Paulette said in her small village, her family had never before seen a black man. "He came with his rifle, and bayonet at the end of his rifle and a hand grenade," she said. "He took the blanket from the hole, and asked my parents if we were hiding Germans. And my parents said no. I remember he gave us the Lifesaver candy, and I always remember this candy." Paulette said after her family escaped from their hand-dug bunker, they returned to their farm. It was there they met an American Airman. "The first plane that crashed over the farm, the pilot was very badly injured," Paulette said. "So my mother took a sheet and put (it) around his arm." At that time, Paulette said, her family had possessed very little to offer. The family barely had food. The Germans, during their occupation, had taken everything from them. But the American Airman, she said, repaid their favor. "He said to my mother, I want to give you that parachute, for your daughters," she said. "And my mom, since we had nothing left -- everything was taken away -- my mother had three dresses made, because we had three girls. For our first communion, my mother had three dresses made out of the parachute." 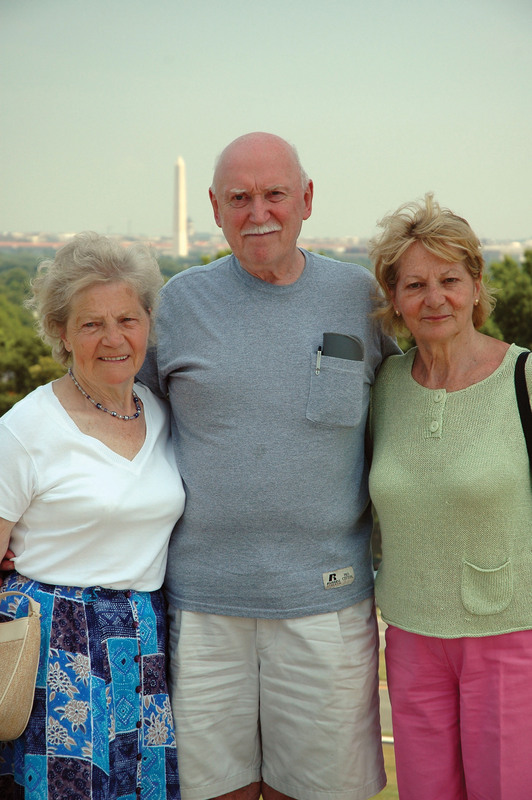 While visiting the Memorial, David and Paulette brought along Paulette's sister, Marie Renouf. David said the three had made a tour of many of the memorials in the District, including the World War II Memorial and the Roosevelt Memorial. The Air Force Memorial, he said, is overwhelming. "I think this is just fantastic," he said. "It makes me dizzy just looking at it. It is amazing. I think all the memorials are."